Jobu introduces one of his favorite role players for Los Charrúas. For this installment of Get to Know A Uruguayan, I would love to introduce you to a guy who, in the last couple of years, has really become one of my favorite players on the team. You might not see his name in the boxscores a lot, but rest assured he has become a key cog in Uruguay’s recent international success. Meet Egidio Arévalo Ríos! In Uruguay, I’ve only really heard him referred to as Arévalo Ríos, so we’ll keep it at that for the rest of this post (according to wikipedia, he also goes by Egidio Arévalo). As I said before, he’s not going to light up the scoreboard like a Luis Seärez or Diego Forlán might. He’s kind of the equivalent of a “role” player in other American sports. It’s not that, as a midfielder, he isn’t important to the team, you just won’t see his name in the boxscore much. You have to really watch the games to appreciate his true value. Arévalo was born on September 27, 1982 (same day as my mother, same year as myself) and, at 29 years old, has had a decent career in professional fútbol. He started his career as a youngster on Paysandú Bella Vista before moving onto Bella Vista of the Uruguayan Primera División, just before Paysandú Bella Vista was relegated to the second division in 2002 (yes, those are two different teams). 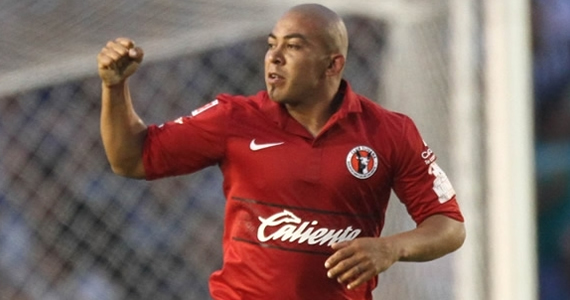 In 2006-2007, He moved over to Peñarol of the Priméra (the hated rivals of my family’s favorite team, Nacional), before spending some time in Mexico. Over the next couple of years, he came back to Uruguay, back to Mexico, back to Peñarol, to Brazil, and finally back to Mexico, where he now plays for Tijuana of the Priméra of Mexico (phew!). To be honest, I didn’t know much about Ríos until world cup 2010. In fact, I didn’t even really know who he was before he was chosen for that squad by head coach Óscar Tabárez. I’m not really sure he’d ever made any kind of real impression at all, internationally speaking. I remember during that World Cup, my father wondering what had gotten into Arévalo Ríos, because he was “comiendose toda la cancha! (eating the whole field)” and playing more aggressively than my father, who watches a lot of Mexican fútbol, had ever seen him play. The midfield was a huge part of Uruguay’s success in that World Cup (and in subsequent games since, including the Copa Ámerica), and the aggressiveness of Ríos was a big part of the reason why. Seriously though, the guy never loses a ball while defending, rarely makes a bad pass and toughs it out against guys much bigger than him (he’s just 5’6″). He (along with Diego “El Russo” Pérez) really help give Los Charrúas some aggressive muscle in the middle of the field (although Ríos is far less reckless than Pérez), and I can’t wait to see what he can do in the 2014 World Cup in Brazil. If he has another World Cup like he did in 2010, I’m curious to see if he’ll receive any offers to play in Europe. Like I said, he might not show up in the boxscores (although he does have three goals in 18 games in Mexico this season), but he’s the kind of guy that can change the game (or keep it in a team’s favor) with his play in the middle of the field. I’m just glad I get to enjoy watching him play for my team.